Lining up with Equal Pay Day held on April 10, Adidas and sister brand, Reebok, are partnering with Lean In, the movement founded by Facebook chief operating officer Sheryl Sandberg to encourage gender equality in the workplace and support equal pay. With the help of Lyft, P&G and a number of local businesses in more than 40 U.S. cities, Lean In is asking consumers to think about the impact of getting 20 percent less as they make everyday purchases on April 10. The #20PercentCounts initiative is the first of three public awareness efforts this year rooted in the idea that equal pay matters. At Adidas stores across the country and on Adidas.com, customers will see the messages of #20PercentCounts on everything from shopping bags to purchase receipts. Reebok is asking online customers to imagine getting 20 percent less of their order. Lyft is turning its in-app vehicle icons into symbols of the gender pay gap. P&G is promoting the importance of equal pay for women in its April brandSAVER, which reaches 46 million U.S. households, as well as sponsoring this year’s campaign videos. 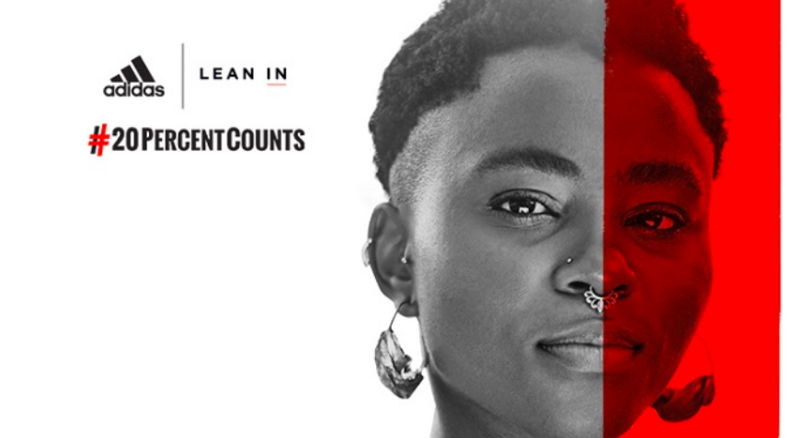 In addition, leaders from the Lean In Circles community—a global network of 36,000 small peer support groups in 162 countries—have recruited businesses in cities including Atlanta, Des Moines, Richmond and Sacramento to promote #20PercentCounts in stores and online. Businesses ranging from coffee shops to dry cleaners will donate 20 percent of sales to organizations that support women and families, including the American Association of University Women, Boys & Girls Clubs of America, Dress for Success and Feeding America. Salesforce, an equal pay pioneer, is providing the financial support for this Lean In community-led initiative, and GoFundMe is providing the social fundraising platform and the Direct Impact Fund to collect and distribute the donations. On Black Women’s Equal Pay Day on August 7 and Latina Equal Pay Day on November 1, Lean In and campaign partners will do the same to highlight the 38 percent and 46 percent pay gaps these women face. According to new research conducted by Lean In and SurveyMonkey, once people know there’s a gender pay gap, most agree it’s a problem. One in three Americans is not aware of the gender pay gap—and men are almost twice as likely to think it does not exist. However, almost 75 percent of people think it would be a major problem or a crisis if they earned 20 percent less money, and an equal percent say the gender pay gap is unfair once they realize it exists. “At Adidas, we believe that through sport, we have the power to change lives. We’re proud to partner with Lean In to raise awareness that women on average are paid 20 percent less than men in the United States. Equal pay matters, and by eliminating the gender pay gap, we can improve the lives of women and their families,” said Karen Parkin, chief HR officer and Adidas executive board member, in a statement. More information on the initiative can be found here.